Although the letter of credit is essentially an international instrument with an age-old pedigree, a troubling number of serious disputes still founder on national provisions with respect to the fraud rule (or fraud exception). The rule is embodied in several major international agreements, but its adjudication takes place under national statutes in which in the opinion of Judge Xiang Gao of the Supreme People's Court of the People's Republic of China (PRC) a significant degree of further refinement and harmonization is called for. Dr. Gao finds the best provisions and practices in respect of the fraud rule in the United States, the United Kingdom, Canada, and Australia, and applies these standards to the reformulation of the fraud rule in the PRC. 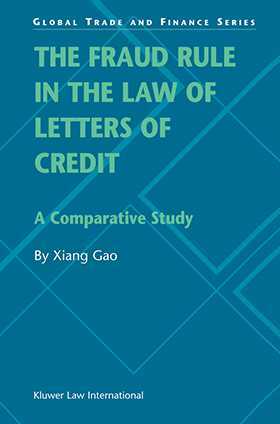 In the process he surveys the entire field of the fraud rule in the law of letters of credit in its substantive aspects, thus going deeper than mere banking law analyses and revealing, for the benefit of jurists everywhere, the fundamental legal issues that must underlie all sound judicial reasoning in the area. In more practical terms, this approach also allows judges to meet their essential responsibility that of giving an answer when a case is put before them with the widest and best possible degree of discernment. Drawing on all of these elements as well as on the drafting process of the Supreme People's Court that led to a new fraud rule provision in 2001, Dr. Gao gives us the deepest and most wide-ranging judicial analysis of this subject available. His unique study will be of great value not only to jurists and academics, but to all lawyers concerned with the legal underpinnings of international trade.